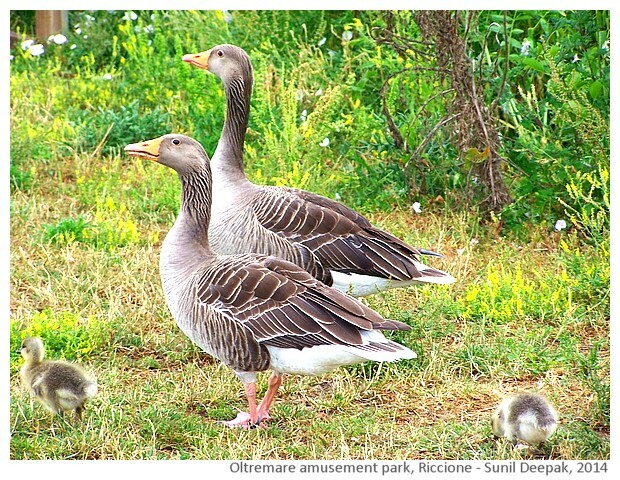 Adriatic coast of Italy, from Ravenna down to Ancona is one long stretch of seaside towns that come alive with tourists every summer. 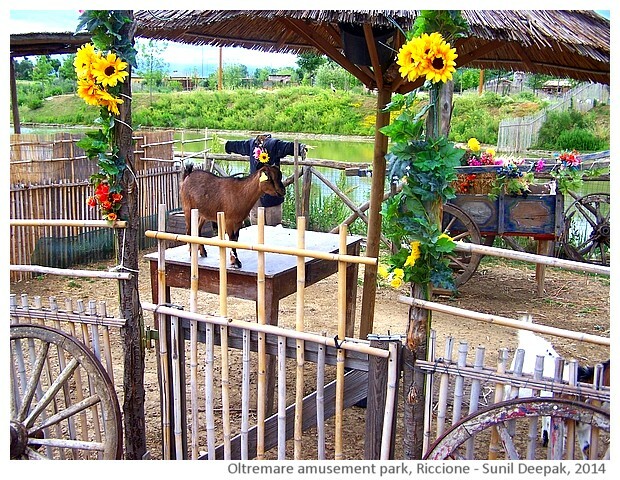 Parts of this seaside route between Savio to Riccione are the most famous and thus, most crowded. 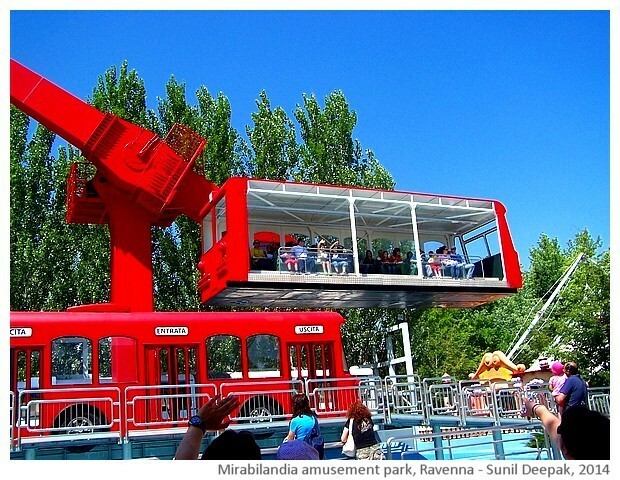 These are also the parts that are full of tourist attractions that open around the end of March and remain open till the end of tourist season in September. 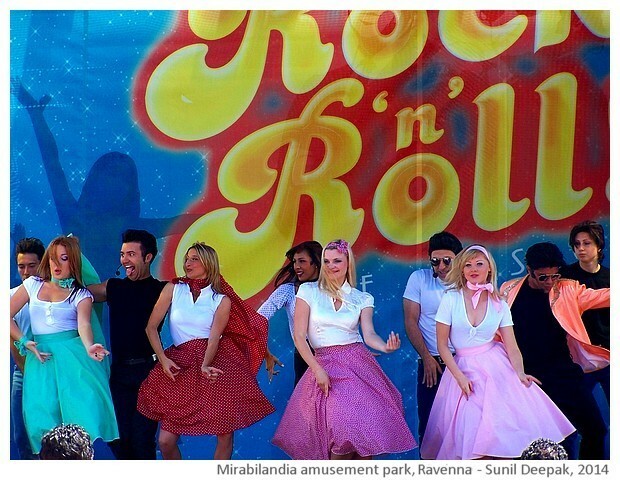 This post is a photoessay about two theme parks in this area - Mirabilandia in Savio and Oltremare in Riccione. 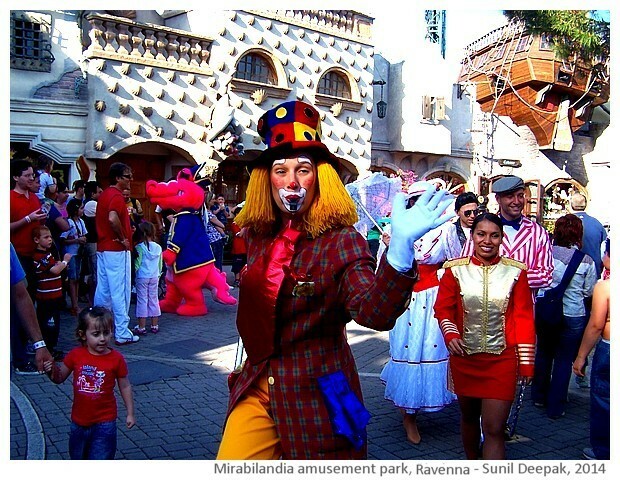 Both these theme parks have an entry ticket of around 30 Euro per person, but they have special offers for hotels-plus-entry and for families, which work out much cheaper. The tickets are valid for two consecutive days. 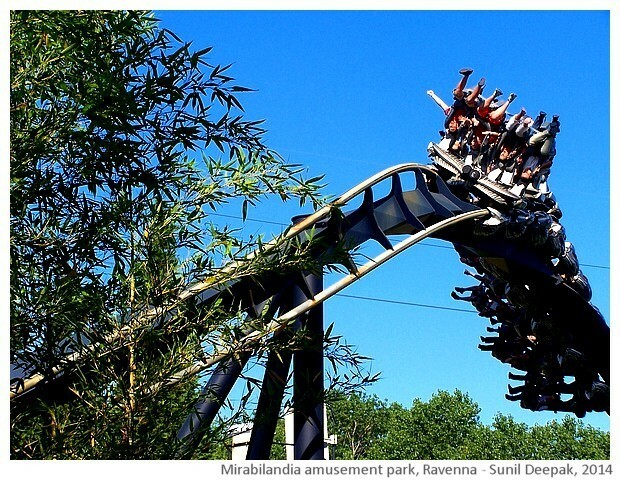 Mirabilandia is a games and adventure theme park. 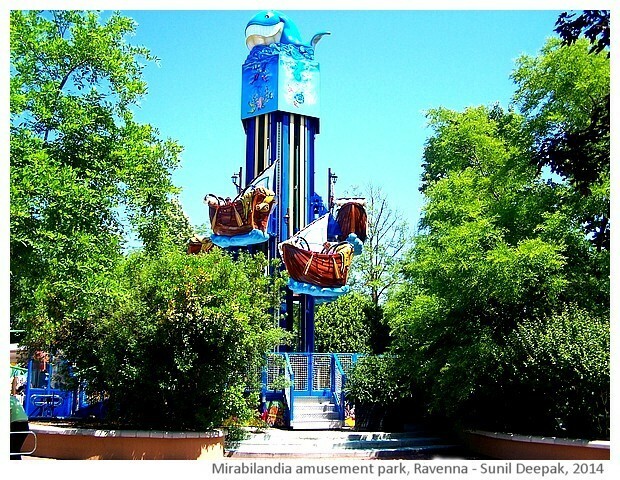 It has many kinds of roller coaster rides including those that splash into water and those that run entirely in water, passing through water falls. 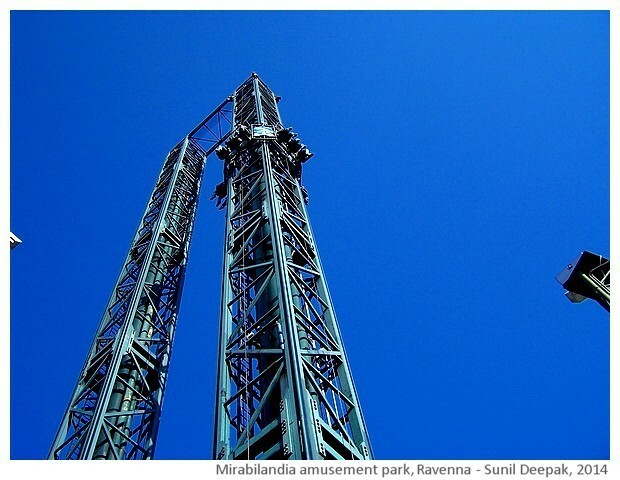 My favourite ride in this park is where the lift takes you up to the top of a tower and then drops you down, stopping just before you touch the ground. It brought me a big rush of adrenaline. 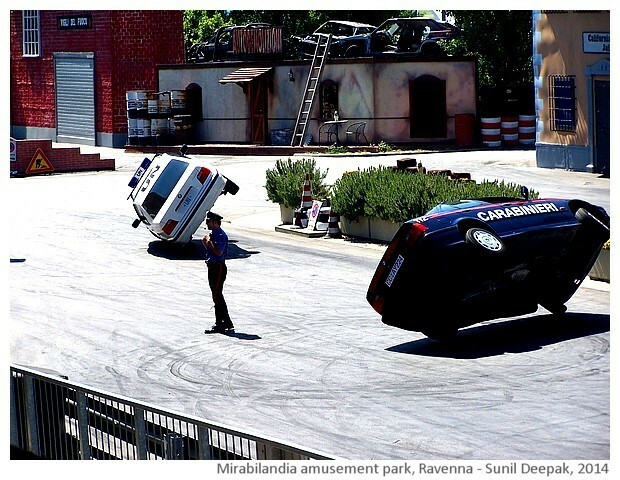 The park also has some cultural shows including dance and music shows, clown shows, and a film stunt show with cars and bombs. 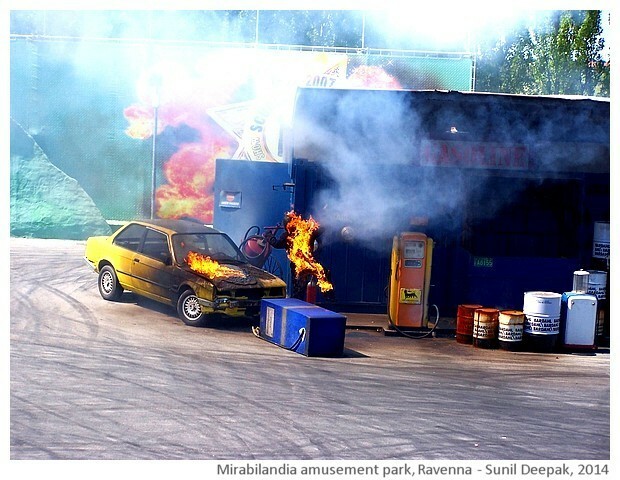 The entry ticket covers the cost of all the rides, the only problem is due to the long queues in front of the popular rides, especially on the weekends and especially in July-August. 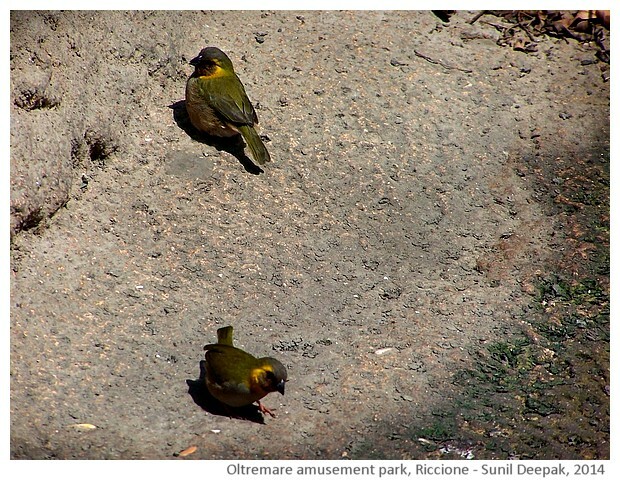 Therefore, I prefer going there during April-May, before the tourist rush starts! 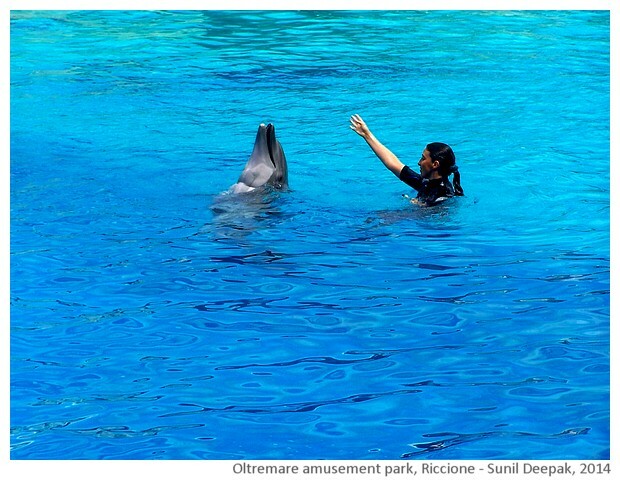 Oltremare is a nature theme park with dolphins, fishes, birds and animals. 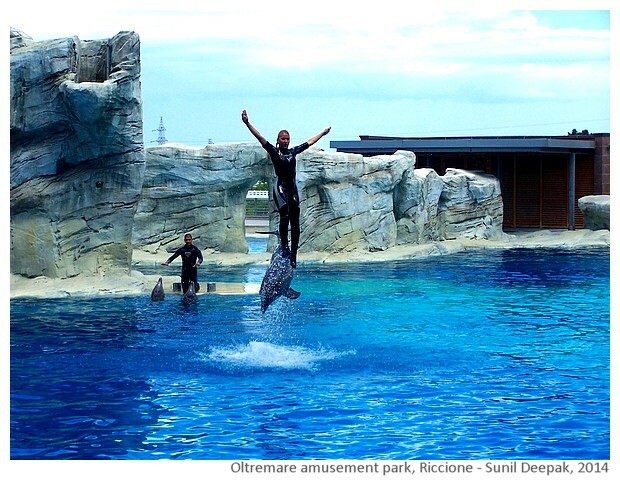 My favourite part of this park is the dolphin show which is simply incredible. I know some persons who do not like the idea of using living beings as part of game shows and would like to close all zoos and animal based shows. 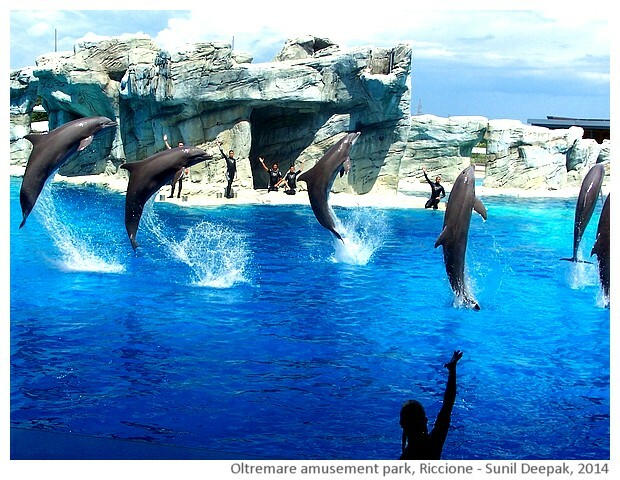 I agree with them that even with the best of conditions, an animal in captivity is never in the same condition as being free. However, I also feel that the world is very careless towards animal lives. The human capacity for killing animals and fishes and destroying the environment in their greed for money is endless. 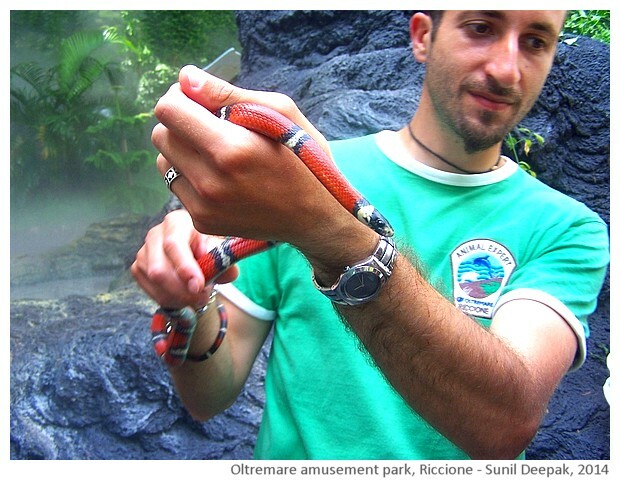 In this situation, I feel that zoos and theme parks play a fundamental role, much more effective than all the books and films, in educating the young people about nature and environment. 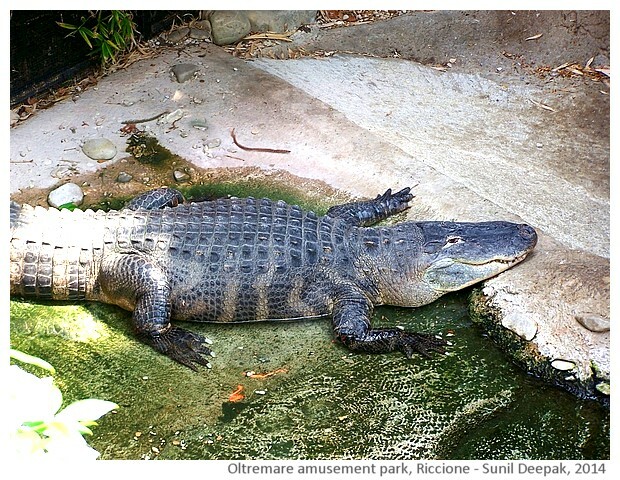 Thus while acknowledging that zoos and theme parks are not the best thing to happen to the animals that live inside them, I think that these are useful and can play an important educational role. 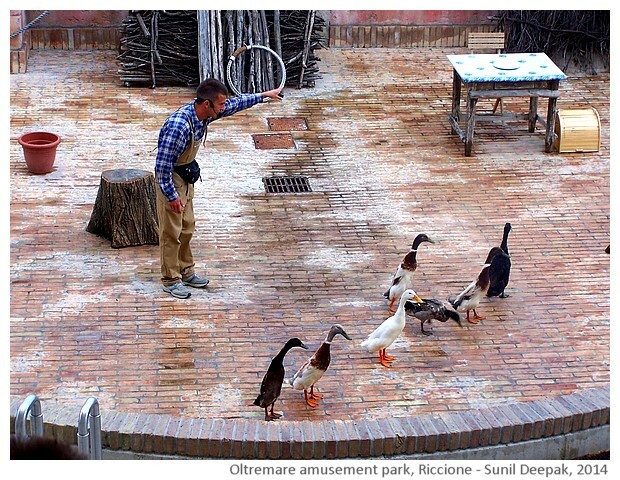 I also love the animal theatre of Oltremare where small birds and animals are the actors. 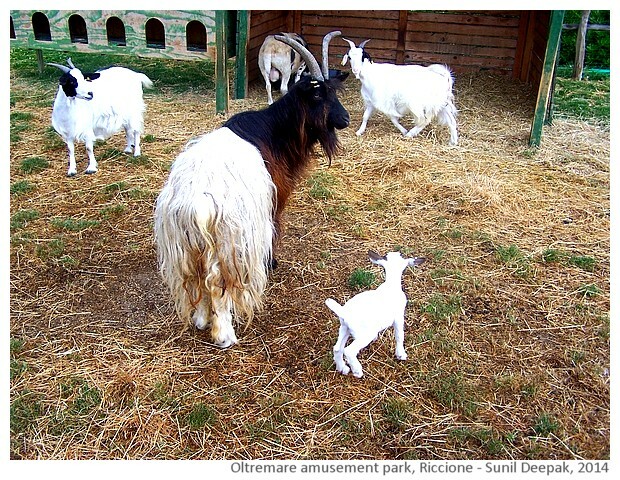 The park also has lot of different areas for looking at close at fishes, other marine beings and animals, including farm animals. 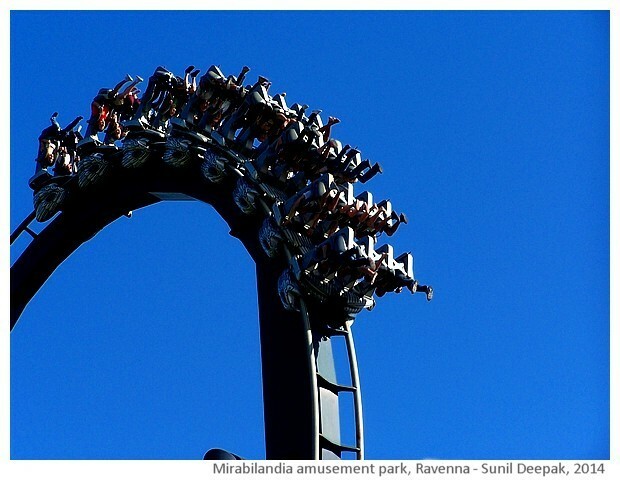 I love both the theme parks, Mirabilandia and Oltremare. 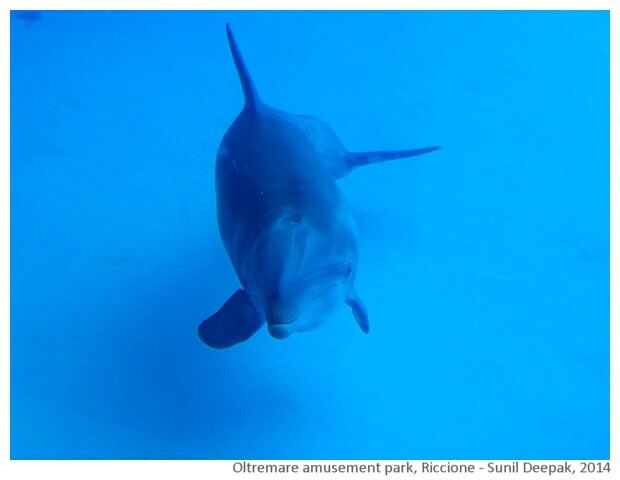 However, if I had to choose only one, I would choose Oltremare, since I love watching the animals. 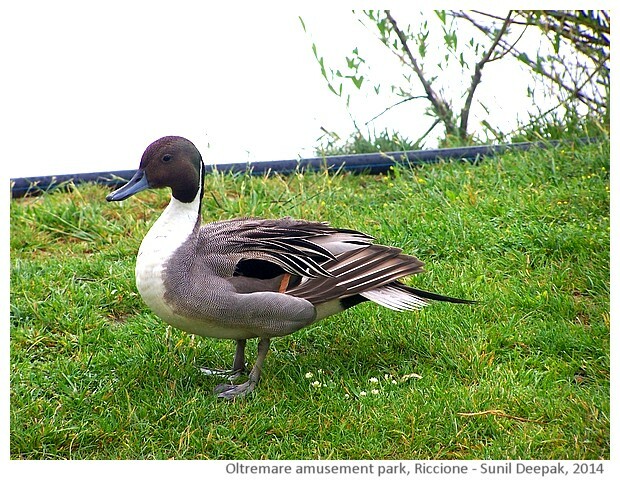 So if you are holidaying in Romagna, the Adiatric coast of Italy, find time to visit these two parks!